'For me, it still felt as though my legs were recovering from our mission to climb Adam’s Peak, when it was that time again to plan another Projects Abroad weekend trip! I decided that something not as ‘hard-core’ as Adam would be a good idea, but a trip without any action would seem like an anti-climax after that. Therefore, white water rafting was the weekend of choice! 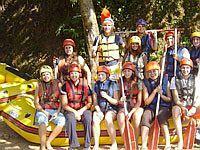 Worryingly, the closest I have ever got to rafting is a banana boat which last time ended up in whiplash and tears, but hey… I’ll try anything once! After thirteen volunteers descended on the Projects Abroad office, off we went in the van to Kithulgala. Quite a few ‘are we nearly there yet’ pleas later and several stops for the driver to ask where we were and we found ourselves at Sisira’s River Lounge. Everyone seemed surprised at how nice the place was and commented on how different it was to what they were expecting – as if I’d take us anywhere less good guys, come on now, have faith. Our arrival was met by a splendid BBQ, with the potato salad being a big hit (I’d heard reports about this before I booked the weekend and it had definitely swayed me to Sisira’s – thanks Jo!) After a busy week of work and knowing that we had to breakfast at 7am, everyone was pretty chilled out and in their pajamas by 11pm. Not quite the ‘party’ that we’re used to but of course it wasn’t without having had a few glasses of arrack first! We were all woken by Sisira ringing an alarm for us to get to breakfast… somewhat reminiscent of a boot camp in my opinion! Then we were rushed off to get to the boats before the water level got too low (I wasn’t even allowed to finish my tea… again boot camp springs to mind!) Everyone donned the ife-jackets and helmets and was then almost reduced to tears when the guy in charge pretended that we had to use a rope to get down to the river (a big drop I can assure you!). Tori embraced the challenge though and even got harnessed up, but luckily for the rest of us, it was at this point that the guy told us that he was only joking and that we could use the steps. Phew! Two boats were used and the first group seemed to have no problem is paddling off. However, my group were a little less speedy and after a few lame attempts at paddling (resulting in going round and round in circles) were forced to get out of the boat for a second ‘lesson’ (probably not the best time for my uncontrollable giggles – our man looked less than impressed.) Unfortunately a lack of rain meant that the water level was a bit too low, but with us all capsizing a few times and people getting stuck on rocks, perhaps this was for the best after all! There was a bit of competition between the two boats, involving paddles, drenching people and Joe being stolen from our boat! Good fun was had by everyone though, and the low water level meant that we could all mess around in the water without being dragged down the river!